Back in 1991 I did a series of illustrations for a set of US commemorative postage stamps, one for each planet and the Moon. There was a spacecraft associated with each world . . . except Pluto. And there was something about that stamp that rankled a lot of scientists. That was when "the mission was born,” Staehl concluded. A team of scientists and engineers at JPL, led by Staehl, was the first to seriously propose a mission to the distant world. This became the Pluto Fast Flyby mission which eventually evolved into the ambitious Pluto-Kuiper Express. Staehl sent me a very nice gift with the signatures of his team surrounding one of the first-day covers. 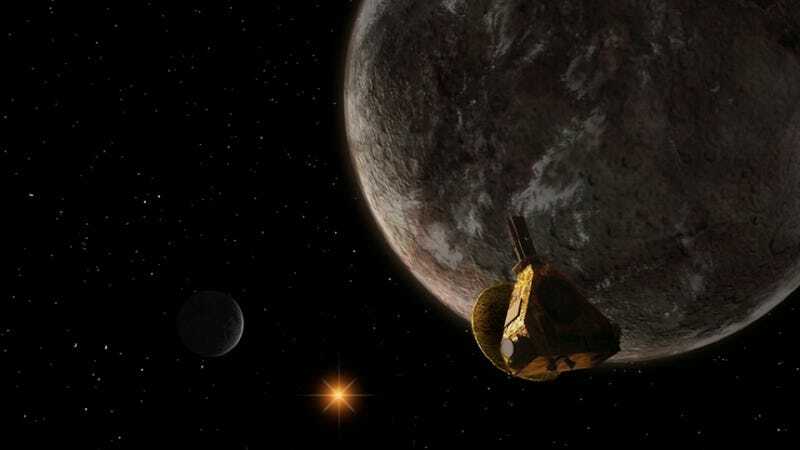 While these JPL plans ultimately never got off the drawing board, the impetus they began eventually morphed in the New Horizons probe, which was launched in 2006. As a kind of thank-you for the original inspiration, Alan Stern—-New Horizon's principal investigator—-attached one of the stamps to the spacecraft, next to the ashes of Clyde Tombaugh, the discoverer of Pluto. My wife and I were also invited to the launch. All this was very cool indeed! It's very, very humbling to think that a sample of my artwork is 2,400,000,000 miles from the earth and in a few years will be swinging past Pluto. My only fear is that the stamp probably wasn't canceled . . . if it wasn't, the spacecraft is going to wind up right back here in 15 years. In that case, I want the stamp for my collection. Now that New Horizons is soon to reach its goal, a campaign has begun to petition the US Postal Service to issue a special commemorative in honor of the event. Where is the Pluto stamp today?